A Simply Chocolate exclusive! - 28 pieces of bliss! 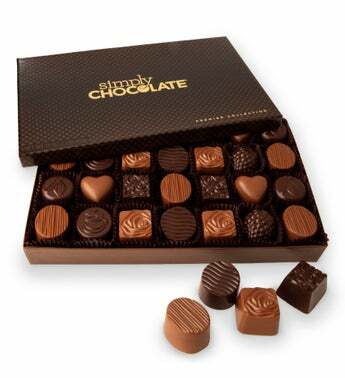 A Simply Chocolate exclusive - 28 pieces of bliss! Our team at Simply Chocolate has spent countless hours working with an artisan chocolatier to perfect this tantalizing assortment. These artful chocolates feature mouth watering flavors like Strawberry Rhubarb, Sea Salt Peanut Butter, Mocha Cream, Hazelnut, and Caramel Coconut. All are beautifully presented in a luxurious gift box.